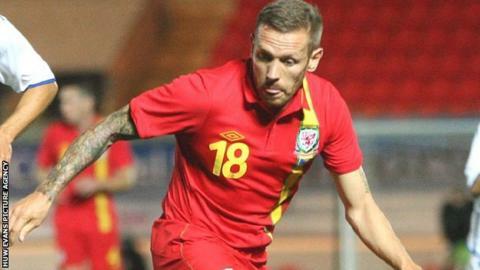 Craig Bellamy is in the Wales squad to play Austria in a friendly at the Liberty Stadium on 6 February. The 33-year-old Cardiff City striker has not played for Wales since the 2-0 defeat against Bosnia in August 2012. Injuries kept Bellamy, who has won 70 caps, out of Wales' last four 2014 World Cup qualifiers. Defender Ashley Williams is captain of the squad which features West Ham midfielder Jack Collison but Leeds striker Steve Morison is out injured. The 28-year-old Swansea centre-back succeeded Aaron Ramsey for the 2014 World Cup qualifiers against Scotland and Croatia last October. Collison's last international appearance was as a substitute in the Gary Speed memorial match against Costa Rica in February 2012. Bellamy's absence from Coleman's World Cup qualifying squads has sparked speculation that the player's international career might be over. Coleman had publicly urged Bellamy to say whether he still wanted to be involved in the squad, but Bellamy had remained non-committal. The player has for some time carefully managed his appearances because of recurring knee problems. The former Liverpool and Manchester City striker has been injury-free since mid-November and was able to start four games in 11 days for Cardiff over the Christmas period. Bellamy is the fifth highest goal-scorer in Wales' history with 19, behind Ian Rush, Trevor Ford, Ivor Allchurch and Dean Saunders. Wales (v Austria): Lewis Price (Crystal Palace), Boaz Myhill (West Brom), Owain Fon Williams (Tranmere), Ashley Williams (Swansea, captain), Jazz Richards (Swansea), Joel Lynch (Huddersfield), Sam Ricketts (Bolton), Chris Gunter (Reading), Adam Matthews (Celtic), Ben Davies (Swansea), Jack Collison (West Ham), Andy King (Leicester), Joe Allen (Liverpool), Aaron Ramsey (Arsenal), David Vaughan (Sunderland), Joe Ledley (Celtic), Gareth Bale (Tottenham), Hal Robson-Kanu (Reading), Sam Vokes (Burnley), Simon Church (Reading), Craig Bellamy (Cardiff) Craig Davies (Bolton).